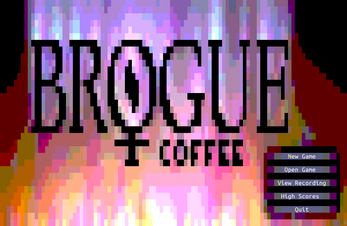 I wanted to make a version of Brogue that one could easily complete a game in a coffee break, but still experience the entire Brogue experience. Included in the download is a .tar.gz file which can be extracted on Linux. Inside, the modified source code can be found. To run the game, open a Terminal window and navigate to the .../coffeebrogue-1.7.4/bin folder using the cd command, then run ./brogue to open the game. I modified the source code from the Linux distribution of Brogue 1.7.4. Credit to Brian Walker for making Brogue. Changes from Brogue 1.7.4: SPOILERS! Too bad I'm on a Win10 laptop with very short HD space and RAM... I can't even install a 10 Go Virtual Machine, much less run it without my computer to crash I guess, as it often do when overloaded. Any chance we'll have a full Windows version anytime please? Thanks!! :) Well, I try it and was propelled from floor 1 to floor 25 while taking the stairs! Alterning in between floor 25 & 26 I died a very early death hahaha!